What should I say about a Game everyone knows? As this was built in most of the Master System I guess nearly everyone who owns a MS know this Game. 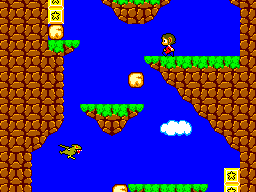 So I make it short and go directly to the plot of the Game: Janken the Great has kidnapped the brother of Alex Kidd. So you are on the Mission to find Janken and rescue the brother. Basically we have here a Jump 'n' Run but as this is a game from Sega (and not Nintendo ;-)) we have some innovative things here. At first there are boxes over the levels, containing extra live, the power bracelet, a ghost who hunts you or money bags in two different sizes: The small ones give you 10 and the big ones 20$. You can spend this money in shops to buy either magic weapons like the Invisible Powder or the A and B Balls, extra lives, the flight cane or vehicles. The vehicles are innovative: a motorcycle, a speed boat and the peticopter, a pedal controlled helicopter, you have to tap a button to fly. Sometimes at the end of a level there is a boss waiting, beside enemies like the ox you just have to punch, there are the henchman of janken and they want to play with you. The Game of Janken also known as Stone, Scissors, Paper, I think everyone knows that. You have to win two matches to beat the henchman. Unfortunately there is no save option or level passwords. Passwords would be great as this is one of the more extensive games and takes some time to finish it. The Graphics are great, remember that Miracle World is almost 20 years old and it still looks better than a lot of other games which came out later. 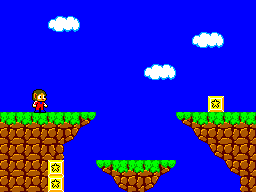 The Levels are large and colorful, but not as unrealistic colored as Alex Kidd - Lost Stars. The Animation are nice, but a bit static on the enemies. The ultimate Theme Song as everyone knows it and it is just great. The other songs, especially the 'castle theme' is great and they are all quite catchy. The effects are the usually bleeps, nothing special. The Controls are simple. Button 1 is for the Punch/Shoot and Button 2 is to jump. Also you need the Pause Button to take use of the Magic or the Bracelet. Quite easy and the only problem is the Pause Button on the Console. A extensive and fun game to play. I have played the game in 1990 and 14 years later I still enjoy playing it as I guess everyone else does. 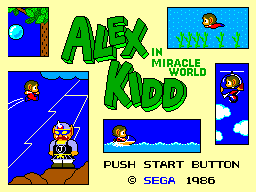 Alex Kidd in Miracle World is one of the All-time Classics. So of course this game is an absolute must-have!